With the advent of smartphones, tablets and other advanced mobile devices, people can conveniently accomplish a requisite task anytime and anywhere, whether it is online shopping, social networking, playing games, watching movies or any thing. It is apparent that what makes it possible for mobile users to perform tasks and stay productive even on the go is the mobile applications. Observing the growing demand of mobile applications and its high end advantages, almost every business is embracing an appropriate mobile application to target potential audiences with a flair. The question is to make an ideal choice between a native app development or mobile web app development. The native applications versus mobile web applications have been a heated debate for a few years now. In this article, we have included the key benefits of native applications. This will distill how native app development can leverage your business by delivering a surefire mobile solution. When an app is developed for a particular mobile platform and is installed straight away on the targeted mobile device, it is referred as a native application. You can reap the benefits of any of the device-specific features, by integrating native features of a device into an app. This kind of applications is released on the platform-specific stores like the Apple App store for iOS, the Google Play store for Android, and so forth. The primary aim of a mobile application is to efficiently reach a wider mobile audience base. Thus, user preference is a major factor that must be considered. The best way to kick around and identify what is most preferred by the majority of users is to observe the recent stats. In this case, most of the users like to access native apps and only a quarter of the total like to browse the Internet. This makes it pretty clear that as more and more people are becoming comfortable with mobile apps and adept with the latest mobile devices, they tend to prefer mobile-optimized apps embracing native functionalities. For those who admire a smooth and flawless user experience, native app is a much sought after choice. You can deliver a polished experience with a simple and blazingly fast mobile app. 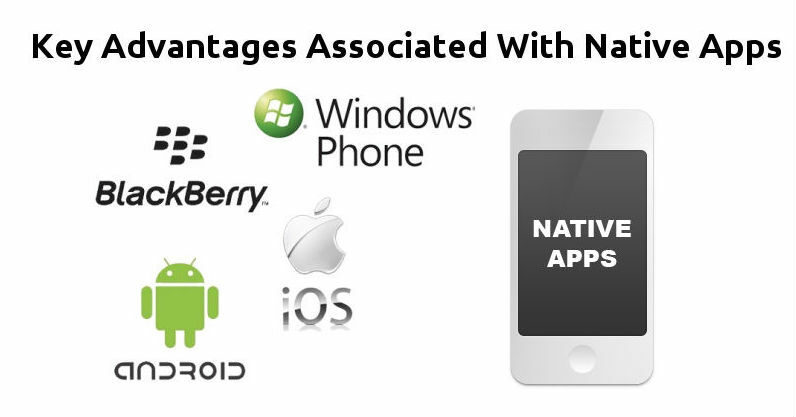 The native apps is lauded for delivering instant response, device optimized interface, and a lot more. Here are a few pros of choosing the native over the mobile web. Supports mobile gestures with a flair: Native apps rapidly respond to users gestures, including scrolling, swiping, pinching and more. Offers clutter-free and legible design: Unlike mobile web apps that include browser elements like navigation, search bar, etc., which clutters the interface and make the design appear shabby, native apps are optimized and designed by keeping the screen real estate of the targeted device in mind. This is because due to smaller screens, app specific controls don’t get enough space. Thus, resulting in a messy layout. Rapidly responds to user actions: When compared, web solutions are found to be more complex and bulkier than native apps, thus, web apps consume additional memory for extra layers. On the contrary, native apps offer lightweight and faster experience by functioning more proficiently with a user’s device. In this wobbly market place, it is quite hard to seek a platform where one can efficiently target his potential audience. However, as native applications are supported by platform-specific app stores, it is a bit easier to reach colossal audiences. Users can easily look for apps of their choice, which are compatible with their device by searching in the concerned app store. For instance, if you are an iPhone user, you can get native apps for your device from the Apple App store. Since, most of the app stores (like the Apple App Store) are quite serious about their reputation, all the apps published in the store are required to get approved by professionals. This approval process ensures completely secure and safe native applications to users. However, not every app store embraces approval policy, thus, all native apps don’t possess tested and assured quality. While developing native mobile applications, developers can deploy prolific and resourceful tools and frameworks offered by the mobile platforms. The platform-specific SDK (Software Development Kit) includes the best tools that can efficiently cater to the needs of developers and offer an ultimate way to accomplish a task. This can leverage native app development by allowing developers to develop with more ease and proficiency. No doubt, there are several benefits of native app development and you can definitely boost your business values by developing a surefire app that caters to your customers’ needs. However, the mobile web applications and hybrid applications also have their own advantages. It is just a matter of perception and your requirements. For this reason, it is always advisable to streamline your choice by taking your business goals into account. This entry was posted on Wednesday, April 1st, 2015 at 17:44 and is filed under Articles. You can follow any responses to this entry through the RSS 2.0 feed. You can leave a response, or trackback from your own site. Lucie Kruger is an application developer for Mobiers Ltd, a mobile app development service provider. She provides concrete information on latest Android, iPhone and other mobile technologies.